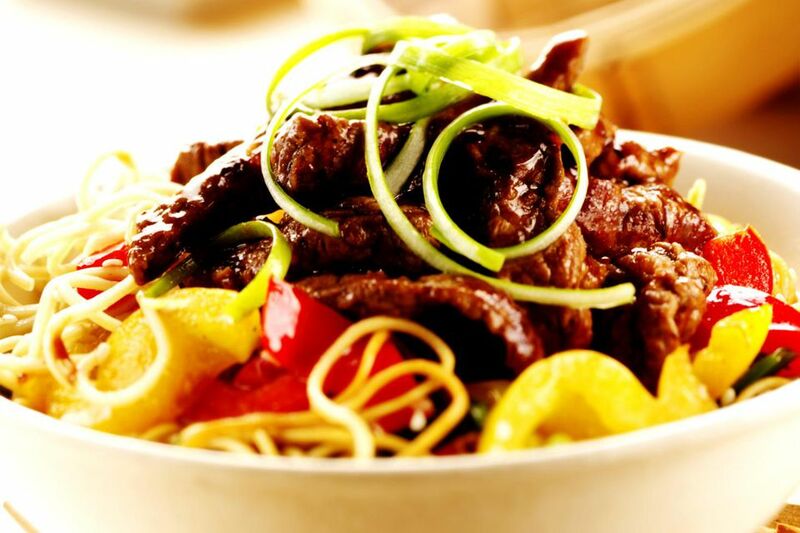 Tender beef strips and vegetables in a rich black bean sauce. 1. Bring 3 cups of water to a boil in a saucepan. Stir in the rice and keep stirring until the water returns to a boil. Cover the pot with a tight-fitting lid, reduce the heat to very low, and simmer gently for 15 minutes. 2. While the rice cooks, mix together the black bean sauce, soy sauce, Chinese rice wine, sugar, and black pepper in a bowl. 3. Heat a wok or large skillet over high heat, add 2 tablespoons of the oil, and stir-fry the beef for 5 minutes. Remove the beef from the wok and set aside on a plate. 4. Heat the remaining oil in the wok and stir-fry the green beans, bell peppers, and onions for 7 minutes. 5. Add the garlic and ginger and stir-fry for another minute, then return the beef to the wok. Add the sauce mixture and stock, then add the cornstarch paste and cook, stirring continuously, until thickened. Serve on a bed of the rice.